The term Revolution is quite inquisitive. The moment it is heard, the first obvious reaction would be anger, aggression and an overall change within a region or the World. But revolution can also mean at the individual level in self transformation. It can also mean a person’s journey through life and hardships. Revolution can happen at the minimal issue such as personal struggle to a bigger level where the social responsibility and social evils itself are questioned. At the same time, revolution doesn’t mean loud and aggression either. It can create the biggest impact when done in deeds instead of long monologues or action sequences! Because this word has so many inner layers and debatable questions- it has become the immediate choice for me to write about those unforgettable Telugu films which spoke about this aspect. Telugu Cinema has touched the aspect of Revolution right from the eternal Black and White era days where the films spoke about predominant problems of agriculture, corruption, newly independent India and so on. However, it was not only the Hero alone who spoke about such issues, but also every other character who found it important to express the concern. Social Inequalities, Gender Injustice, Land Grabbing- and what not? Black and White Telugu Cinema has touched all these aspects in style, empathy and amazing clarity. To add to the brilliance, revolutionary lyric writers like Sri Sri, Arudra and Athreya have given some of the greatest songs which inspired a generation of thought by questioning the wrong doings around the World in a poetic manner. As times changed slightly from the 60s decade till 70s where Cinema itself had undergone lot of new improvements, the revolutionary theme also underwent some major changes. Women oriented subjects gained more popularity with the advent of directors like K.Balachander, K.Vishwanath, Bapu along with subjects where the Industrial Revolution and Labor problems were dealt in great care. This era saw the protagonist facing new set of issues like unemployment, falling in love, interstate marriages, self control and what not? This era’s protagonist questioned the bigger facets of life with more clarity and personal zeal. This era also saw the new age woman coming out for working and becoming the sole breadwinner of the family, and witnessed some really talented actresses like Jayaprada, Jayasudha, Saritha , Sujatha and so on who adorned these roles with masterful perfection. 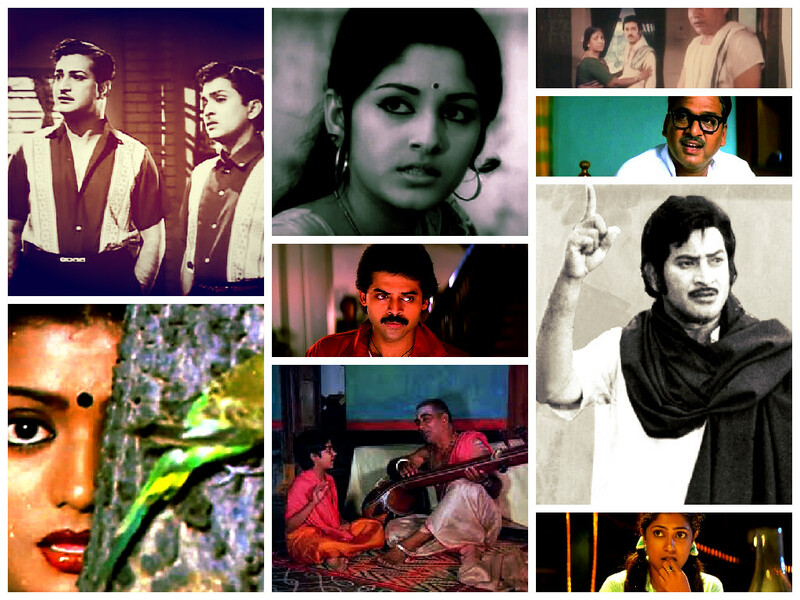 The decade of 80s is one of the most defining transformation moments for Telugu Cinema. A set of new filmmakers such as Vamshi, Kranthi Kumar, Jandhyala, Ram Gopal Varma and so on started making their own different set of films which spoke of revolution in various forms. We saw the life of a successful actress who has a shadowed past (Sitara), a young woman who lives with her single mother (Swathi), a laid back girl who questions dowry (Srivariki Prema Lekha) , a young college student who fights mafia (Shiva) in mesmerizing clarity. These characters are strong within as well as made a difference in how people thought and presented their ideas. Telugu Cinema adapted towards changing times right from then, where it witnessed the bigger challenge of modernization impacting strong Indian values and culture in a graceful manner. Right from the 90s decade till the new age post 2005 era, Telugu Cinema continued to produce films which had the protagonist question about the wrong happenings and what doesn’t look right in breathtaking clarity and in an awe inspiring manner. Marapuraani Chitralu is going to offer a timeless tribute to such films which made us re-think about the way of living, and how a medium called Cinema influenced generations to come. Next postMoney, Life, Values and Entrepreneurship- Challenge Part 1! well presented about revolution. should have taken some examples of movies like sankharabharanam, Maro charitra, Aakali rajyam etc.